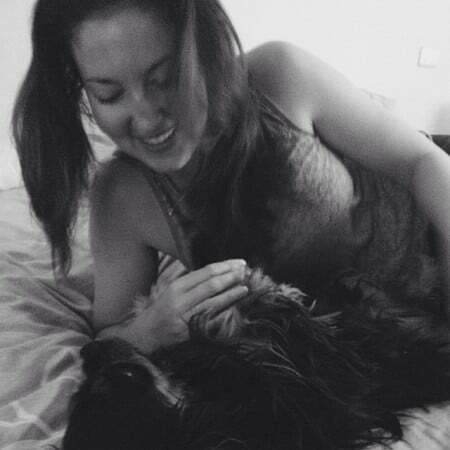 Many of us share our first foray into life in France by way of TAPIF. The Teaching Assistant Program in France allows native English speakers to come and teach English in French schools. Both legal and paid, the teaching assistant program can be a fantastic way to get your feet wet in France and experience life here. I quit my job in NYC to do the program for the 2009-10 school year and had a 7-month contract teaching in the Val D’Oise outside Paris. I don’t regret it for a minute, but moving to Europe is not a decision to be made lightly. Are you thinking of doing the program? Have you already? 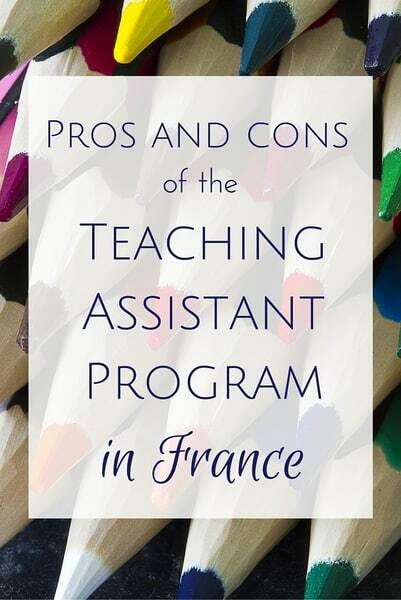 Here’s my list of pros and cons of the Teaching Assistant Program in France, called TAPIF for short, along with some info about what it is exactly. Note: TAPIF requirements and procedures may have changed since I did in the program in 2009-10. This post is based on my experience with TAPIF six years ago. Please refer to the official program website for the most up-to-date information. When I applied to TAPIF, I was working in New York City and felt like I needed a change. 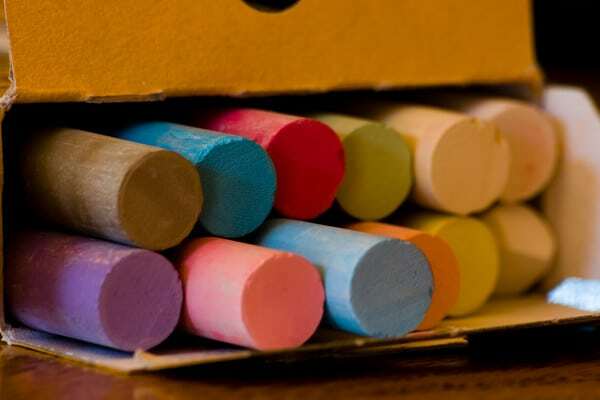 I started looking for different opportunities and the teaching assistant program really appealed to me. I had always been interested in French and felt like there was no harm in applying. Besides, I didn’t have a mortgage, spouse or kids, so what did I have to lose? I applied and crossed my fingers. A few months later I was accepted and nervously quit my job to embark on a new life in a suburb of Paris. I was assigned to two primary schools a short bus ride away from where I found housing. Rent is not cheap in la région Parisienne but I got lucky when the stars aligned. A friend of someone in my French class at Alliance Française who lived in France knew someone from church who had a renovated garden shed behind her house in her yard, which just happened to be the town over from where I was assigned to teach. Yes, I lived in a converted shed for 300 euros/month. I used a space heater, didn’t have a kitchen, and the ceilings were so low that I had to crouch down if I had on any type of shoe or boot with a heel. But hey, it was cheap and got the job done! The French Ministry of Education, the Centre international d’études pédagogiques (CIEP) and the Cultural Services of the French Embassy have joined forces for the program, whose goal is to employ native speakers to strengthen English-language instruction in French schools. What’s the TAPIF work like? So in theory, that’s what an assistant does in a nutshell. We’re given training ahead of time with other assistants in the department and they do their best to prepare us for the French students. Also, let me point out that two assistants (even in the same department) can have vastly different experiences — and this just comes with the territory. Here’s a FAQ for prospective applicants. This isn’t a volunteer position! You’re paid for the work you’ve been hired to do and have a work visa and contract. Many assistants used TAPIF as a way to get their foot in the door, so to speak, with teaching and working in France and then pursue other work opportunities in France or abroad after the program ends. As a legal French resident, you’ll be given a social security number and set up in the French national healthcare system, Sécurité sociale. “70% of medical costs, 35-65% of prescriptions, and 80% of hospitalization fees in France” are covered but assistants are encouraged to purchase travel health insurance that will pay for medical emergencies that occur outside of France. I had a plan with Seven Corners that I never had to use but was happy to know was there just in case. You don’t need to have teaching experience, fluent French or a masters degree. Being a native English speaker with an intermediate level of French between the ages of 20 and 30 were the main criteria when I did the program. TAPIF France has gotten more competitive over the years with more and more applicants, but still, if you meet the requirements you have a decent shot at being accepted. I don’t know the TAPIF acceptance rate but it’s not super competitive. I guess this depends on your definition of “fun” but come on, you get to teach kids! Most of the time, they’re thrilled to shift gears from copying French grammar off the board and take part in an interactive lesson. While any job can be stressful, this one ranks pretty low when it comes to the work itself. For young kids like the ones I taught (5-11 years old), we played a lot of games and did fun exercises that had everyone smiling and enjoying themselves. Only 12 hours/week of work. Even with lesson planning, you won’t be THAT busy. This will give you plenty of time to socialize, travel, practice your French or pursue other interests. I managed to do a fair amount of traveling around France and also went to Morocco, London, Prague, Croatia and Venice during breaks. You’ll be able to discover France, its people and culture — and hopefully improve your French! Speaking to actual French people involved a steep learning curve and I realized the French conversations I’d practiced in my language classes back home in the USA only prepared me halfway. I quickly learned the “real French” and really enjoyed getting to know the French and their way of life firsthand. Also, just like the students, the assistants have vacation too! Generous breaks over Christmas, in February and again in April give you loads of time to better acquaint yourself with France and Europe! Lack of support from the TAPIF program. This is going to vary due to a bunch of factors, but not all of the schools and teachers are supportive of the program and won’t necessarily help you. My teachers were using me as a teacher, not an assistant, so I would often plan the lessons myself and be up in front of the kids entirely alone while the teacher sat in the back and texted or sometimes even left the room! That was not the plan and the person I was supposed to reach out to in case of problems wasn’t really responsive. Then a few weeks later when someone from the TAPIF program came to observe me one day, she was horrified at how the teachers at my schools took no part in the English lessons! Some assistants had great support from their teachers and schools but more often than not, the assistant isn’t kept in the loop (I showed up to teach on a day when there was a planned strike but no one told me!). Several assistants I know left after a few months because of this lack of support and feeling like they were just floating around in a big sea of chaos. Be prepared to speak up for yourself! While this can also be a pro, it can make you stress about what you’re going to do for work after the program is over. Finding a job in France isn’t simple by any means, and after your visa expires and you have to leave, finding a job in France from abroad is infinitely more difficult. The job market in the USA isn’t great either. My advice? If you want to work after the program ends, start your job search early and don’t ignore the power of networking. Keep in touch with out assistants, let everyone you know what kind of work you’re searching for and go for it. I actually did find a job in France after the assistant program was over but the money they offered me (in Paris) for full-time work was ridiculously low (I would have had to find something worse than the garden shed in Paris!) and I turned down the offer. Jobs are out there if you’re persistent and try to keep a positive attitude along the way. You may be placed completely randomly. On the TAPIF application, you choose three areas of France that you’d ideally like to teach, and while the program does their best to place everyone accordingly, it doesn’t always work out that way. I knew of assistants who were placed in the middle of nowhere in places they didn’t list as their top three. Of course this happens and you may end up somewhere you didn’t request. It’s the luck of the draw. Sometimes you make the best of it and everything works out but sometimes you’ll be placed in a less than desirable area. More info on the académies can be found here. The TAPIF workweek is short and schedule may be all over the place. 12 hours/week may not sound like a lot and it’s not! In some cases the teacher might use you even less. I was lucky in that my two schools blocked all my time together three days a week so I didn’t have to be at the school all day for just one or two classes hours apart. For some people, teaching for an hour or two in the morning and then again in the afternoon may not be a problem but having a 6-hour window in the middle of the day can be problematic if you have a long commute to your school. The pay is not enough to live on. Well not live well anyway. You’re only paid for a 12-hour workweek and the TAPIF salary comes out to about 790 euros/month net — no matter where you are placed in France. 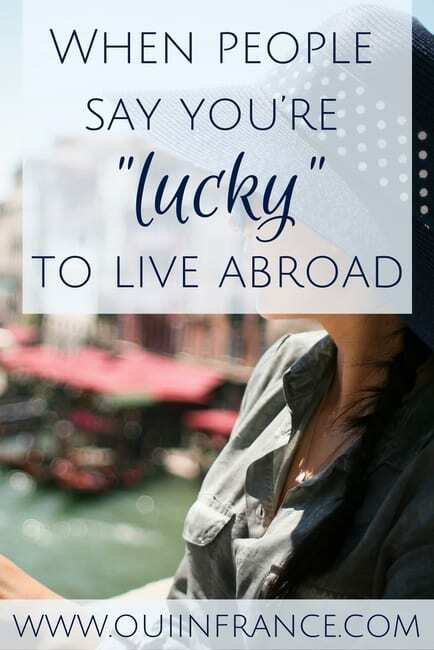 Once you factor in rent (some assistants live in student housing for free or reduced rates but it’s not the norm), transportation, cell service, food, etc., you may not have enough to really enjoy your life (and that goes double if you’re in the Paris area). Without substantial savings, the salary from TAPIF will not be enough to travel around Europe and take advantage of everything around you. So save, save, and save some more before you come! Would you believe it if I told you that I never received my carte vitale (health insurance card) in the 7 months I was employed? It’s true. My dossier was always “still processing” whenever I’d follow up. An assistant I knew down by Limoges had hers within 2 months and it was even delivered in a nice little dossier with tons of information. So moral here? Don’t expect everything to happen in a timely and orderly manner. 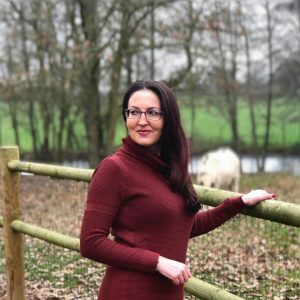 Patience is super important when it comes to all things having to do with French red tape, and as an assistant, you’ll encounter enough to last a lifetime. 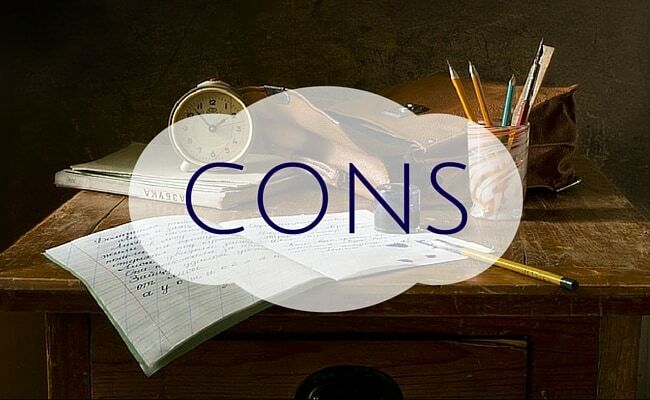 So voilà, my thoughts on the pros and cons of the Teaching Assistant Program in France (TAPIF). The TAPIF program allowed me to get my feet wet in France and pursue a new way of life for 7 months. It forced me to step outside of my comfort zone, far away from my family and friends — and all in French! Was it easy? Hell no! Did I have some issues along the way? Yup. BUT, all in all? I’d do it again. France is where I fell in love with Tom. It’s where I now live. TAPIF is a part of my story and was a worthwhile experience. Bottom line: If you’ve got a good amount of savings, an open mind, an interest in teaching and a desire to live in France, I say go for it. The TAPIF program is worth it! Questions? Feel free to email me. Happy to help! Did you do the TAPIF program? If so, how was your experience? Do you have any pros and cons of the Teaching Assistant Program in France to add to my list? This is fascinating–I’d never heard of this before. Thank you for such a thorough explanation! I can think of a few young people who might be interested. You’re very welcome. Glad I could spread the word on the program! I think it’s a great opportunity for people looking to experience France and/or teaching. Thank you — I figured “it’s now or never” so just made the jump and everything worked out. But with life anywhere, not every day is easy and I’d be lying if I said I never had days where I’ve wanted to just go back home! Great post! thanks for this it helped a lot. hoping to continue my teaching profession. So happy to hear it, Ralph! Where do you teach? Bon week-end !